The public is invited to the annual celebration of Belle Isle at the 10th Shiver on the River today with entertainment and the opening of the island's venues, including the shuttered aquarium. City officials closed the then 101-year-old aquarium in 2005 as part of budget cuts, but the nonprofit Friends of Belle Isle Aquarium has tended to the facility and the remaining fish that were not relocated. Also open will be the Anna Scripps Whitcomb Conservatory, the Belle Isle Nature Zoo, the Dossin Great Lakes Museum and the Belle Isle Casino, where most of the events will take place. The event is free. "It's just a wonderful accumulation of everything you could think about with that island," said Murray Gula of the Friends of Belle Isle Aquarium, one of the sponsors. The group is working on a business plan for the aquarium that would allow it to reopen the aquarium through private and grant monies, Gula said. Eventually, the group will need a lease agreement with the city to allow it to operate the aquarium. The group is raffling off a new car, hotel stay and dinner at the event to raise money for its efforts. "A lot of good things can happen with this if we just keep pushing forward," Gula said. "Obviously, it's going to take a lot of time and money to get it back open, but we can't stop." 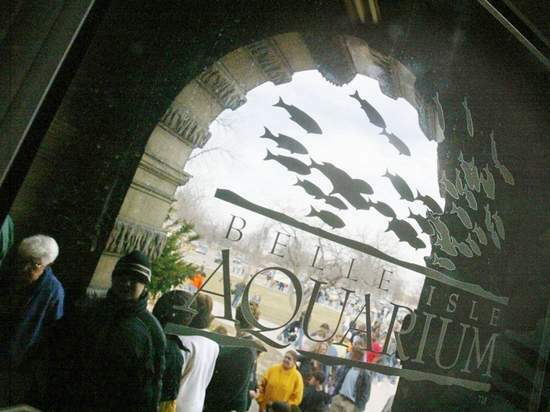 Thousands of people wait to enter the Belle Isle Aquarium on March 30, 2005. It closed days later, falling victim to budget cuts in Detroit. The Friends of Belle Isle Aquarium has tended to the facility since then.